Posted on 19, September 2016 by EuropaWire PR Editors | This entry was posted in Automotive, Germany, Industrial, Marketing, Technology, Transportation & Logistics and tagged Continental, ContiTech lightweight air spring, Diethelm Bauch, Eckard Neitzel, IAA Commercial Vehicles. Bookmark the permalink. HANOVER, 19-Sep-2016 — /EuropaWire/ — For use in trucks, ContiTech offers an air spring with an innovative plastic piston in a lightweight design, which further reduces the weight of the vehicle and features an integrated buffer support for the first time. By fully utilizing the inner volume, ride quality is improved meaning that the new lightweight air springs can replace the elastic axle stops. These will be presented for the first time in Europe at IAA Commercial Vehicles. ContiTech is continuously reducing the weight of its air springs by replacing other steel or aluminum components with plastic components. “Standards in the quality, pay load, and efficiency of vehicles are constantly rising. To meet these standards, lightweight, weight-reducing components are now more important than ever,” says Diethelm Bauch, head of the ContiTech Air Spring Systems segment. In developing plastic pistons, Continental has already set new standards. The plastic pistons made using injection molding allow the entire inner volume of the piston to be utilized. The innovative design ensures good ride quality and simplifies installation in the vehicle. Compared with using steel components, the weight of the vehicle can be reduced by 12 kilograms per drive axle with lightweight air springs. The lightweight air springs are extremely corrosion-resistant and durable, which increases the resale value of vehicles. ContiTech also offers new product solutions to meet the increasing requirements created by small installation spaces, maximum spring travel, and challenging axle angles. 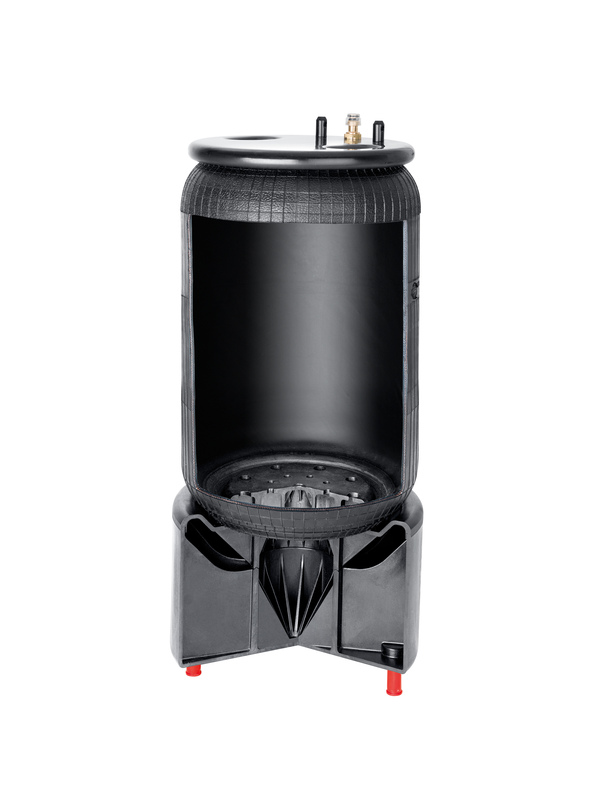 This includes an air spring with an innovative bellows contour for use with lifting leading and trailing axles. The special bellows contour allows for the controlled formation of double folds in an unpressurized state. “Thanks to the special design, it is possible to combine a long bellow length with a small installation and compressed height and achieve distinct axle angles. In vehicles, this results in more loading space and maximum flexibility for loading and unloading operations on ramps,” says Eckard Neitzel, head of product development at ContiTech Air Spring Systems. As a division in the Continental group, ContiTech is one of the world’s leading industrial specialists. Its customers can be found in key industries such as machine and plant engineering, mining, the agricultural industry, and the automotive industry. With around 43,000 employees in 44 countries, the company uses its development and material expertise for products and systems made of rubber, plastic, metal, textile, and electronic components to combine these with individual services. ContiTech always thinks in terms of customer-friendly and environmentally-friendly solutions – going well and truly beyond its roots as a producer of rubber products. With sales of €5.4 billion (2015), this international technology partner is active with core branches in Europe, Asia, NAFTA, and South America.